When a sinkhole is discovered, examined and tested by an Civil Engineer (Foundation Masters) or Geo Engineer, a repair method will be developed depending on the size, location, and the soil conditions under and around the sinkhole. Most Sinkholes are generally small, a hole that’s very small and in an open area can simply be filled with dirt. When larger holes open, and away from structures they can be excavated down 10′ or so and caped with a concrete slab. When a Sinkhole can be capped with concrete, this will saves thousands of dollars, the cap will stop the raveling of soils. When a s Sinkhole forms you must contact an Engineer for a Sinkhole Repair Plan. When Sinkholes occur under a structure, this is when it becomes more of a difficult Sinkhole Repair. A Civil or Geological Engineer must use specialized equipment to determine the nature and extent of the Sinkhole formation. Once the Sinkhole formation is understood, the Engineer develops a Sinkhole Stabilization Plan. This plan usually calls for grout of some kind to be pumped under pressure to fill voids and compact soil with cement like mixture material. There are many different ways to Repair a Sinkhole, Foundation Masters, LLC Civil Engineer Ken Sands P.E. will help you with the most cost effective Sinkhole Repair. and Soil Stabilization Techniques for Sinkhole Remediation, Pressure Grouting and Foundation Repair in Florida. 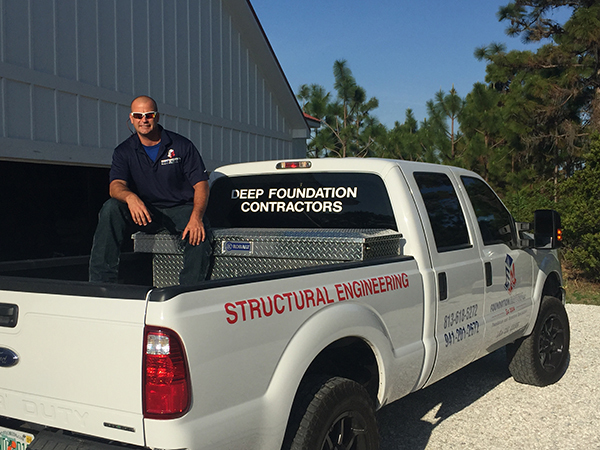 Foundation Masters, LLC is a design and build company, that builds the best Foundation Repair and Sinkhole Repair Products for Foundation Repair in Florida. Foundation Masters, LLC will provide you with a free visual inspection and also provide you with a free set of preliminary plans for your Foundation Repair or Sinkhole Repair in Florida. A massive, slowly-expanding sinkhole in Florida has local residents frightened and passersby curious about a year after a much bigger Sinkhole sucked a Tampa-area man into oblivion. Foundation Masters, LLC works with Sinkholes, LLC by installing early sinkhole detection systems. Please feel free to call 813-614-1718 and speak to our Engineers.